Google Adwords Auto Call Extensions are Coming! 2017 is less than a month old, and we have already seen a number of changes and updates made to Google’s regulations about site content and AdWords advertising policies. For the most part, these new policies will be beneficial to both users and website owners, especially those who have been made aware of the upcoming changes and have already taken steps to keep their websites functioning accordingly. Making sure your website is updated according to Google’s new policies and extensions will not only give you an edge in search rankings against any competitors who have yet to make the necessary updates to their own sites, but will also keep your site among the most user-friendly on the web, which is the intent behind each of Google’s new policies. Google Predicts A 20% Increase In Calls! One upcoming change that is designed to make mobile sites in particular more user friendly is the addition of automatic call extensions. Until now, site owners could manually add a call extension that would enable mobile users to quickly click through and contact their business via telephone directly from the Google search result page. This streamlined method of letting customers contact businesses without having to navigate and search a main page or landing page for contact info led to an average increase of 5% in click-through rates. 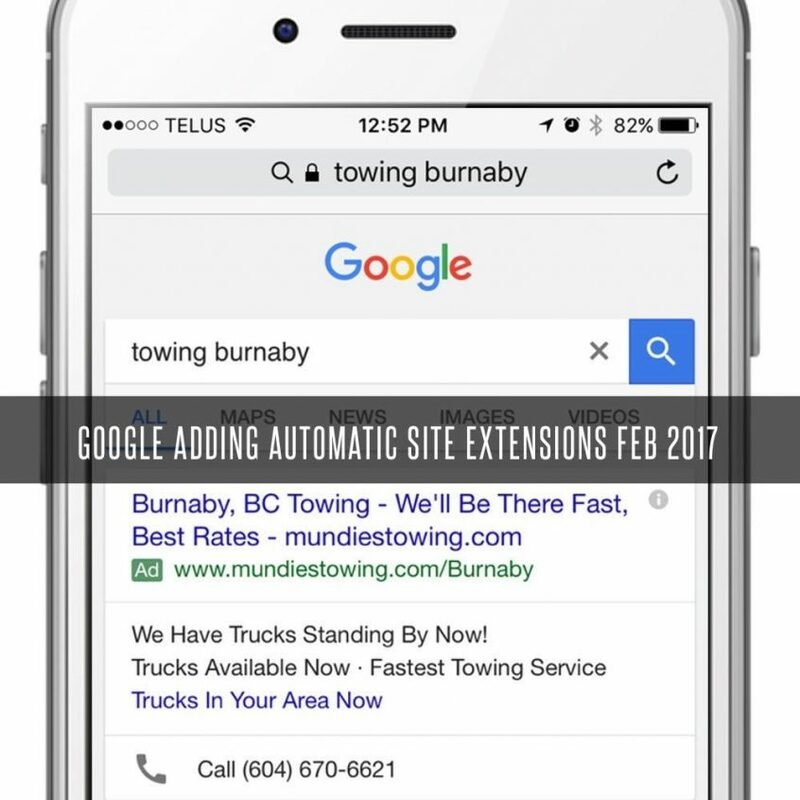 Due to this success, Google has elected to automatically add call extensions for mobile ads as of February 6th 2017 and predicts an increase of nearly 20% in calls through mobile searches and advertisements, as opposed to just using landing pages with phone numbers listed. When is Google Adwords Automatic Site Extensions Being Turned On? So, what does this mean for your company’s mobile website? There are actually a few possible ways this new addition can affect your mobile site, depending on how you wish to go about generating leads via telephone. Some businesses will likely jump at the chance to have more customers reach their company more easily by phone, while others may wish to avoid paying for calls through mobile search ads. If you already have call extensions added to your mobile search ads, you won’t be affected at all by the changes. Similarly, site owners who are in favour of the impending update simply have to wait for February 6th for the changes to take place. If you want to gain a more detailed understanding about what this update and others like it from Google will do for your company in 2017, be sure to contact our digital marketing agency in Vancouver. Our experienced team of digital marketing experts will help you make the most of your business’ website, no matter how large or small your client base, by keeping you ahead of the game when it comes to new updates and policies from Google. Feel free to contact us at our Vancouver office to set up a consultation, or follow us via Facebook and Twitter to receive more helpful tips and updates like this!